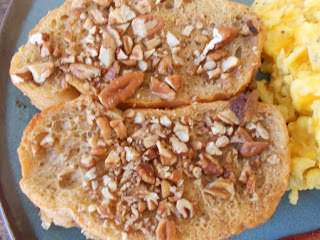 Continuing our holiday breakfast theme, here’s Naomi’s Overnight French toast Casserole. The beauty of this is that that you can prepare it the night before, then simply pop it into the oven the next morning and let it cook while you’re having fun with your overnights guests. When I say how much I love PINTEREST, it is because I come across recipes like this! Now, I love me some french toast and this reminded me why I love it so much! This had a fantastic blend of flavors and then topped with the crunch of pecans and a Cinnamon/brown sugar “glaze”. Serve it with a warmed maple syrup and it is heaven on earth. Now, it takes 12 hours to prepare so be sure to do the planning to make it. I served it with Paula Deen’s “The Lady’s Perfect Scrambled Eggs” and bacon. So good…. Consider it for a brunch, breakfast or, like me, breakfast for dinner. 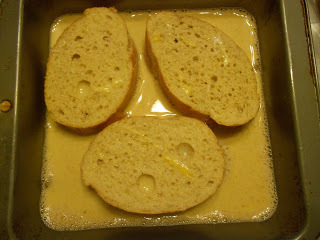 1) Combine melted butter and brown sugar, place in a 10 x 15 pan. 3) Combine the next 6 ingredients in a large bowl. 4) Pour over bread, top with pecans and wrap with saran wrap. Place in the refrigerator for 12 hours. 5) Take pan out of the fridge 10 minutes prior to baking and preheat oven to 350 degrees. 6) Bake for 35 to 40 minutes. If it starts to brown too quickly, tent with tinfoil. 7) Serve slices with powdered sugar and maple syrup.